Rancho Cucamonga Shoppers: You are just 20 minutes away from Andrews, Inc. located in Glendora Village. Andrews Inc offers a wide selection of Allen Edmonds shoes. 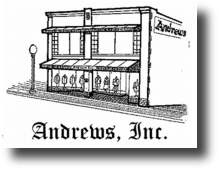 Andrews Inc in Glendora brings Allen Edmonds Shoes and Footwear to Rancho Cucamonga California shoppers. The genesis of great American shoes as crafted by Allen Edmonds starts with timeless designs-elegant brogues, burnished plain toes, plain or perforated captoes, bluchers, balmorals, Venetian slip-ons, chukka boots-that bring to bear an All-American sensibility inspired by great men, great cities and sometimes, the great outdoors. We use premium leather varieties and finishes to make a unique statement that's usually understated and always classic. Allen Edmonds shoes will exceed all your expectations.